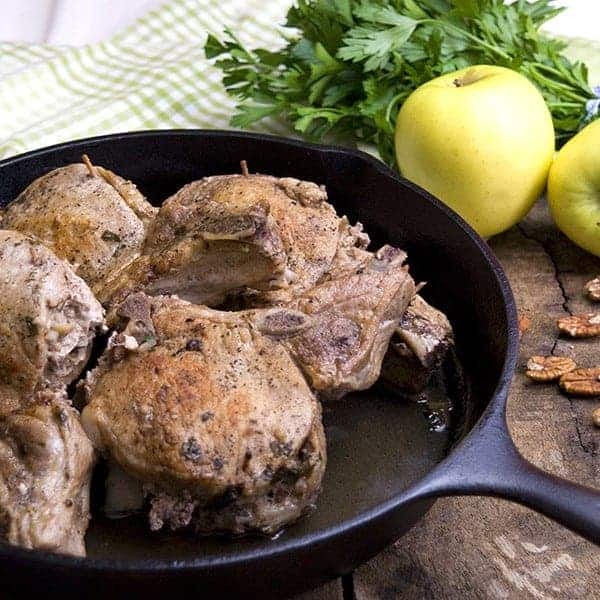 Apple Pecan Stuffed Pork Chops – thick pork chops stuffed with an apple and pecan mixture and roasted to perfection. With the arrival of the fall season, it seems that everyone’s mind automatically switches over from salads and iced drinks to more warm, homey foods. Some of my personal favorites are all the comforting soups and stews that go hand in hand with fall weather. But I could never forget one of our local fall produce stars – apples! The area of north Georgia where we live is a huge producer of apples supplying an average of 2 million pounds per year. There are dozens of orchards within a short drive from us and they produce some of the best, tastiest apples you’ve ever seen! I love using our local apples to make a big batch of Spiced Applesauce in the Slow Cooker that we freeze and enjoy throughout the year. When we think of apples, we almost always think “sweet” don’t we? Pies, crisps, crumbles, tarts, cakes, baked apples, applesauce. They’re all certainly delicious, but sometimes I wanted to do something different and along a savory route like these Apple Pecan Stuffed Pork Chops. These stuffed chops are easy to prepare and make a pretty presentation for a company dinner. They’re also perfect for a weekend family meal. The apple and pecan combination is an interesting complement to the savory pork. I hope you’ll give this recipe a try. 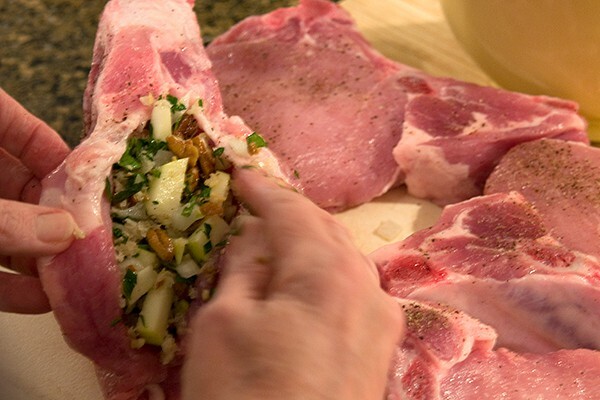 For a stuffing pork chop, you want a thickness of at least 1 1/2 inches. A thinner chop is difficult to work with in creating the pockets for the stuffing. Also, you’ll need a very sharp, long, thin knife to make the task easier. Of course, you could just ask your butcher to do it for you if you don’t want to do it yourself. Also, if I was serving this for guests, I’d remove the flesh from the bone at the lower end of the chop creating a Frenched effect. These were for family, so I didn’t bother with that. 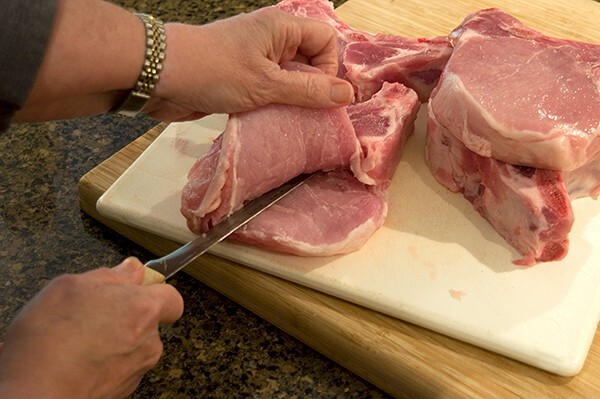 Be sure to trim the pork chops of any excess fat. Then create the pockets by cutting through the flesh of each pork chop nearly to the bone. Liberally season the chops both inside and out with salt and pepper. Set aside. 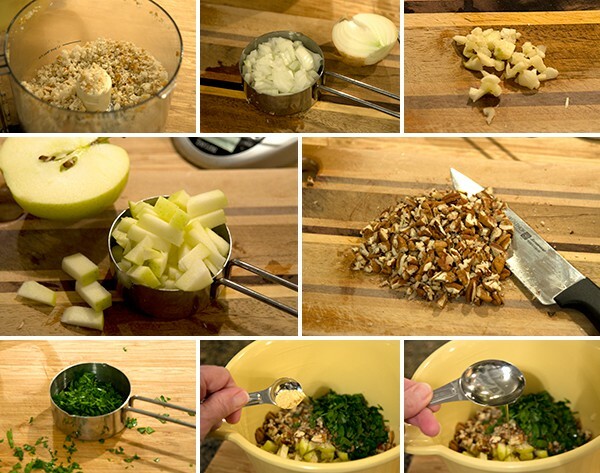 Stuff the pocket of each chop with a generous amount of the bread-apple-pecan mixture. You should have plenty of the mixture to fill four large chops. Secure the opening with toothpicks. I used two – one at the top and one at the bottom. Heat a large cast iron skillet over medium-high heat. Add the remaining 2 tablespoons of canola oil and the butter. Add the chops, two at a time, and cook until nicely browned on both sides. Add all four browned chops back to the pan and add the chicken broth or stock. I was using my big 12″ cast iron skillet and had to fit those chops in there like they were pieces of a jigsaw puzzle, but it worked out! Cover the skillet with a lid or with aluminum foil. Transfer to the oven and cook for 45 minutes to 1 hour, basting occasionally with the pan juices. Check often making sure not to overcook. Remove the pan from the oven and transfer the chops to a plate. Tent with foil to keep warm. Strain the cooking juices to remove any solid bits and return the strained juices to the pan. 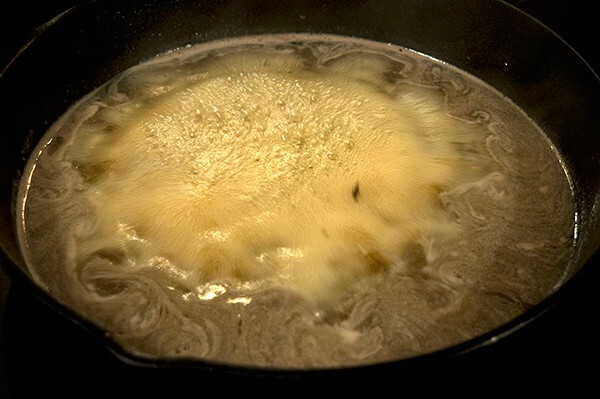 Cook over high heat at a rapid boil until reduced to your desired consistency to create a sauce to serve with the chops. The sauce may be finished with a teaspoon or two of butter if desired. Pin to Your Pinterest Main Dishes Board! 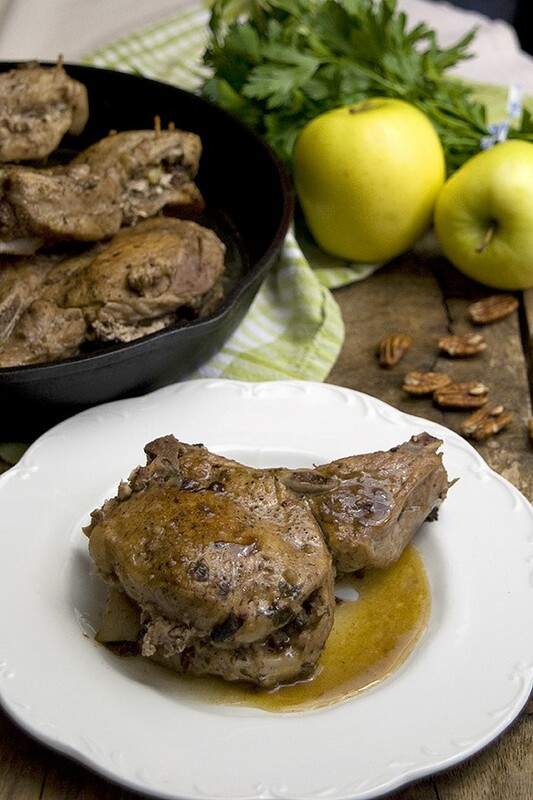 Thick pork chops stuffed with an apple-pecan mixture and roasted to perfection. 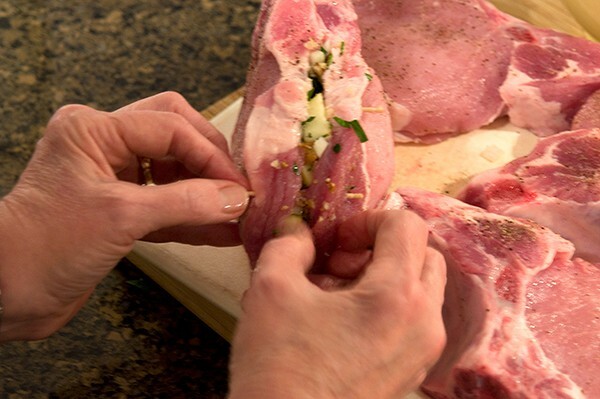 Trim the pork chops of any excess fat. Create a pocket in each chop by cutting through the flesh nearly to the bone. 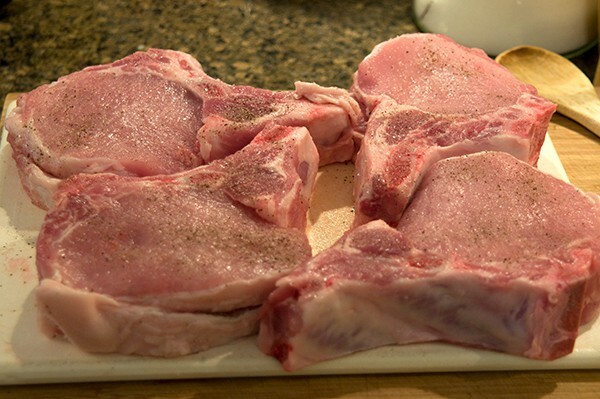 Season the chops inside and out with salt and pepper. Set aside. In a medium bowl, combine the fresh bread crumbs, chopped onion, minced garlic, chopped apple, pecans, parsley, mustard, 2 tablespoons oil, salt and pepper. Mix well. Stuff the pocket of each chop with a generous amount of the bread-apple-pecan mixture. Secure the opening with toothpicks. Heat a large cast iron skillet over medium high heat. Add the remaining canola oil and butter. Add the chops, two at a time, and cook until nicely browned on both sides. Add all four browned chops back to the pan and add the chicken broth or stock. Cover the skillet with a lid or with aluminum foil. Transfer to the oven and cook for 45 minutes to 1 hour, basting occasionally with pan juices. Check often making sure not to overcook. Strain the cooking juices to remove any solid bits and return the strained juices to the pan. Cook over high heat at a rapid boil until juices are reduced to your desired consistency to create a sauce to serve with the chops. The sauce may be finished with a teaspoon or two of butter if desired. Nutrition information is calculated by Nutritonix and may not always be perfectly accurate. Use your own judgment. Be sure to follow me on instagram and hashtag #nevrenoughthyme or tag @nevrenoughthyme so I can see and share what you make! These look wonderful Lana! I love savory apple dishes almost as much as I do sweet ones, and apples are a natural with pork. Fantastic! 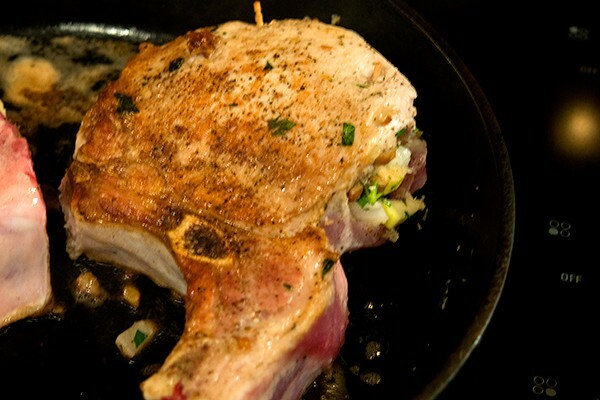 You’ve reminded me of a stuffed pork chop recipe I used to make that is quite similar! I’m going to have to try your spectacular version—the family will be thrilled to see these beautiess for dinner!!! 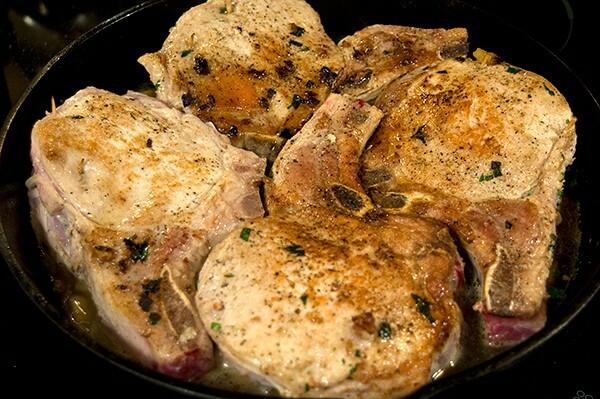 Wow, these seriously look like the BEST pork chops ever!! Definitely adding these to my must-make list! Now that’s a stuffed pork chop! Looks amazing Lana. I adore stuffed pork chops and love this recipe. Looks so perfect for this time of year! Yum! Saving this for an easy company dish. These look so good, they’re making my mouth water! I had no idea Georgia produced so many apples, fun fact and wonderful recipe! I haven’t stuffed a pork chop in a really long time. This filling sounds awesome! What a hearty Fall meal – pure comfort food! My family would go crazy for these pork chops! What a delicious recipe! I love pork chops, but I’ve never stuffed them. With your excellent photos, it will be easy to take that next step and make a truly beautiful looking set of chops for a festive dinner. Your apple stuffing is superb looking too – what a lovely way to amp up the flavor of pork chops! I love making stuffed pork chops! These look fantastic and i love the idea of adding in pecans too. My Georgia born and raised grandmother would have gone crazy over something like this….yum! This is a delicious way to use up all those fall apples! I can’t imagine anything that I would love more, right now! I am sooooo making these this weekend! They look like the perfect fall weekend treat! Stuffed pork chops are exactly what I think of when I think fall comfort food. Crisp, juicy apples are a perfect pairing. I love stuffed chops. They are so delicious and perfect for cooler weather. Nothing better than pork chops and apples. This looks SO amazing. Oh Lana these sound amazing. I don’t think I have any thick pork chops but I’m so desperate to try this I might have to sew 2 thin ones together. :) Yum really is the word! Those are some thick pork chops! Apples and pork are a perfect match. Exquisitely done! Such a nice treat apples with pork chops is classic and you have done it so well. I love thick-cut chops like this – and that stuffing is just blowing my mind! Thanks for this . I have some chops and was in a quandary as to how to prepare a different dish. Making this now.